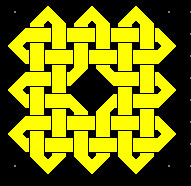 I find Celtic knots and knotwork attractive and very ‘weaverly’. I think it’s my Irish ancestry bubbling up. I enjoy tying (or at least trying to tie) a simple cord and transform it into a Celtic knot. When I need a Celtic knot “fix”, there are a number of resources available that allow me to basically doodle away in designing Celtic knots. Sometimes they turn into something real . . . like a pendant. Sometimes they are merely a diversion . . . although, time seems to pass quickly. Sometimes I develop ideas for new projects. Years ago, I was fortunate enough to take a workshop on Celtic line drawing with Cheryl Samuel. In case you may be interested in learning to design your Celtic knots and lines, one of the resources below may be just the thing. 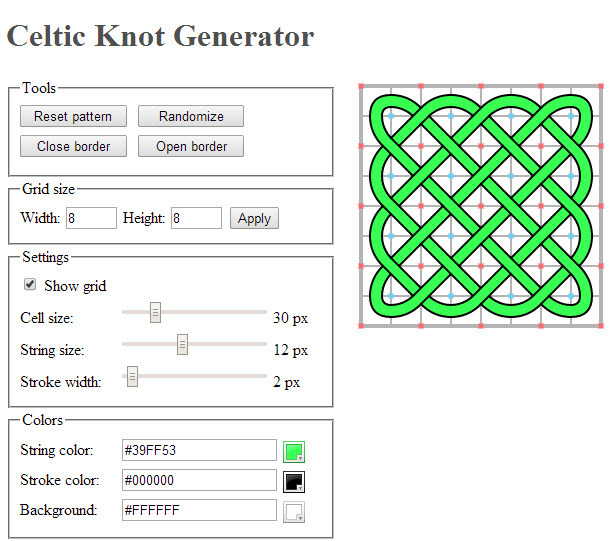 This resource literally allows you to click your way into designing a Celtic knot. 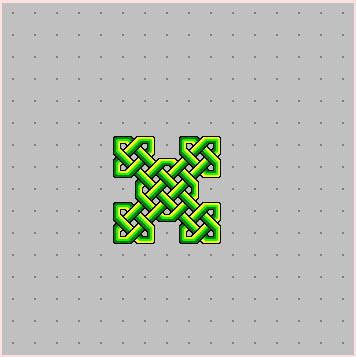 Using your mouse, select the Celtic knot type from the right side. Then, click into the space on the left side and watch your Celtic knot develop. Very easy! If you would like to kick your Celtic knot design experience up a level, the same website has a ‘manual’ way to design Celtic knots. In addition to to selecting your style, you also have a set of tools that allow you design corners, edges, and more. This is important since designing the interlacement is one thing . . . designing the edges and corners is another thing altogether. 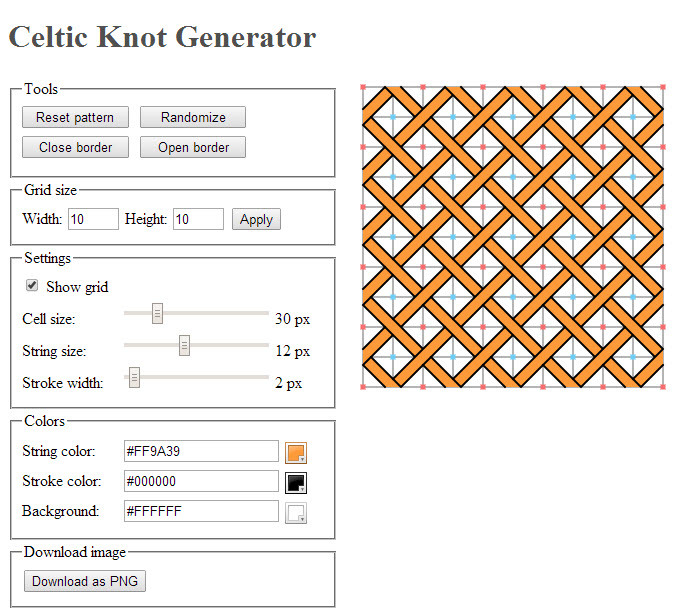 The Obyx Celtic Knot Generator – http://www.obyx.org/knots.obyx?width=20&height=20&border=8&style=14&tile=0&mirror=3 The Obyx Celtic Knot Generator allows a user to manipulate the parameters of a Celtic knot (e.g., height, width, mirroring, etc.) to see how it impacts the results. 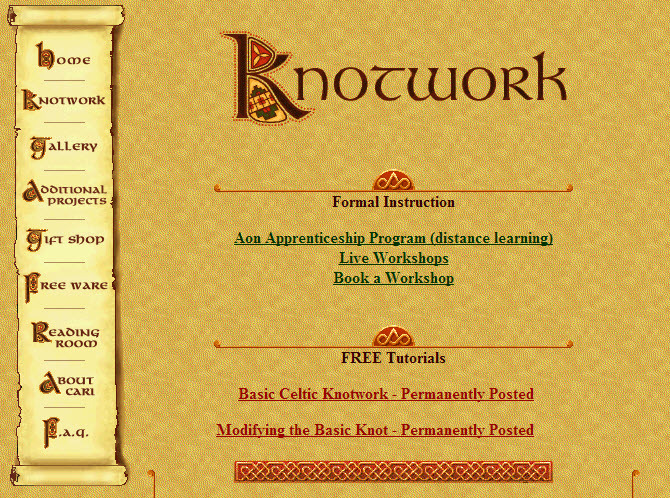 To get started, go to Basic Celtic Knotwork . . . there you will find a three-part tutorial . . . plus, even a short video animation. 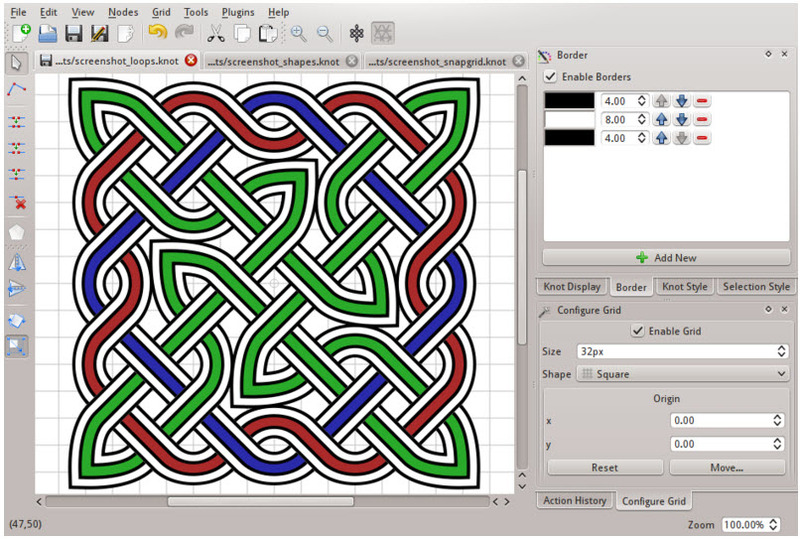 The Celtic Knot Generator at http://w-shadow.com/celtic-knots/ is another option to indulge yourself in Celtic knot drawing. Again, you can manipulate the parameters and see what happens. 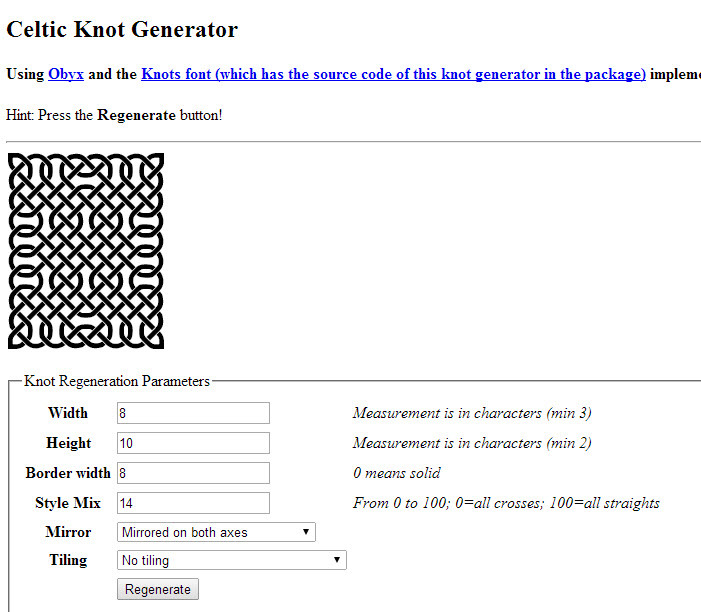 Below are images of the default screen and one of a simple knot I made. Is your mouse not working? Don’t worry! 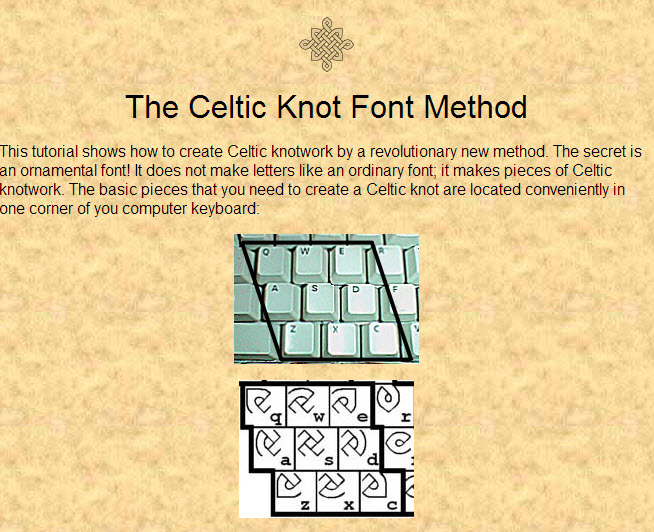 You can make Celtic knots by using your keyboard. 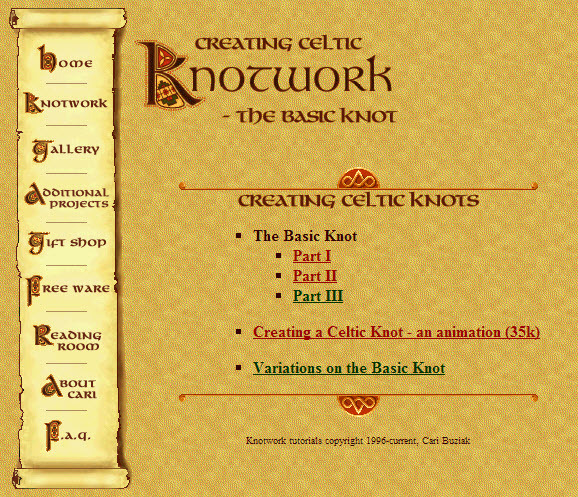 Clan Badge offers tutorials in two different ways to draw Celtic Knotwork. – http://www.clanbadge.com/tutorial.htm . . . one of them shows you how to use your keyboard. Knotter – http://knotter.mattbas.org/Knotter – This takes a little longer to learn, but it’s worth it if you feel up to the challenge. 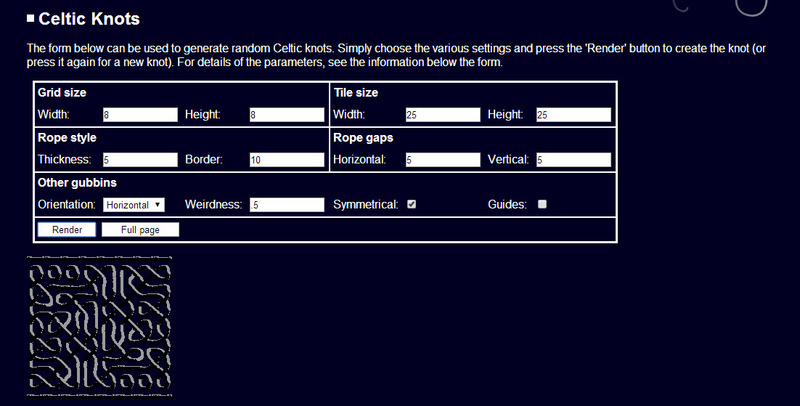 This is not meant to be an exhaustive list of Celtic knot design resources . . . just something to get you started. I hope you have fun while you learn how to design Celtic knots. Thank you, Robyn! I first became interested in Celtic knots when I took a class with Cheryl Samuel. You have given many more web references – I am overwhelmed and thrilled! Cheryl’s great! I really enjoyed her workshop. I hope you enjoy these resources. Just keep an eye on the clock. Time seems to pass quickly while designing Celtic knots. Robyn, this opens a whole new window in my things-to-explore house! I took your class at Midwest Weavers last summer on jewelry making and I’m thinking one could use thrums for these knots, right? Absolutely! I like you’re kind of thinking!